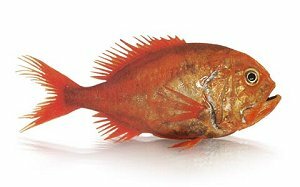 Orange Roughy have a bright reddish orange head and body and their mouth and gill cavities are black. Their head is covered with bony ridges and deep mucus cavities. The dorsal fin has 6 spines (the last one being the longest) and 15-18 rays. They mainly live in deep, cold (4°-7°C) waters over steel continental middle and lower slopes and oceanic ridges. They have been recorded from as deep as 1809 metres in the north Atlantic Ocean. In Australia they live in waters from 700m to at least 1400m, on the continental shelf slope between Port Stephens in New South Wales and Cape Naturaliste in Western Australia. They are also found on the South Tasman Rise, Cascade Plateau and Lord Howe Rise. Orange Roughy have been found over both flat bottoms and steep rough grounds, such as pinnacles and canyons. Adult fish form dense spawning aggregations for several weeks in winter. Orange Roughy are synchronous spawners (that is they shed eggs and sperm into the water at the same time) Orange Roughy produce between 10,000 and 90,000 large eggs (2.0 - 2.5mm in diameter) The eggs are buoyant when fertilised and hatch about 10 - 20 days after fertilisation. Orange Roughy are believed to be slow growers and natural mortality is probably low. Although a reliable ageing technique is yet to be developed, radiometric ageing techniques suggest that Orange Roughy can live to at least 149 years. Maturity is thought to occur between 20 and 32 years, when the fish are 28-32cm long and weigh between 500 and 800g. Orange Roughy feed opportunistically on bentho-pelagic and meso-pelagic fish, such as viperfish, lanternfish and whiptails, also on crustaceans, amphipods and mysids. They particularly like jewel squid. Juvenile roughy feed mainly on crustaceans, while mature fish eat predominantly fish and squid. They have moderately high rates of food consumption. Natural predators of Orange Roughy include Oilfish and large Basketwork Eels. Coarse flakes. Medium to firm. Medium to high. Oil content high. The darker the Roughy meat the lower the quality. In New Zealand the Roughy is caught headed, gutted and frozen at sea then thawed, processed and refrozen on land. In Australia where the fish is closer to shore the fish are caught then processed and frozen ashore. This is where the marketing term once frozen is applied Some packers pump Roughy with phosphates so care in purchasing and receiving must be taken. The fat underneath the skin must be completely removed as it contains an indigestible oily wax that causes diarrhea in humans. Orange roughy are currently managed as five separate stocks inside the Australian Fishing Zone (AFZ). A separate stock is fished by both Australian and New Zealand fishers at a place called the South Tasman Rise which lies on the edge of Australia's Fishing Zone some 200 nautical miles south of Tasmania. All but one of Australia's orange roughy stocks (the Cascade Plateau) is severely overfished by demersal (bottom) trawling by the South East Trawl Fishery. The South East Trawl Fishery is a large multi-species bottom trawl fishery which hunts a mixture of finfish (or scalefish) species and invertebrates, including orange roughy, on the continental shelf, slope and offshore seamounts around southern Australia.